Klobuchar has cast herself as a moderate voice of the Midwest, a once-reliably Democratic region where the party struggled in 2016 — losing Michigan and Wisconsin to Trump, and eking out only a narrow 1.5-point victory in Minnesota. In the midterms last year, Klobuchar won re-election in Minnesota by almost 25 points. She spoke literally of building bridges, recalling the collapse of Minneapolis’ I-35W bridge in 2007, which killed 13 people, and the rebuilding that followed, as well as the Mississippi River as a symbol of the heartland and a connector of the country. The crowd on Minneapolis’ Boom Island cheered just as loudly for Klobuchar’s history of reaching across the aisle and their lieutenant governor’s promises of “civility” and “decency” as they did for Klobuchar’s line condemning “foreign policy by tweet.” A man who shouted “Lock him up!” during Klobuchar’s speech was shushed by the woman next to him. In recent weeks, Klobuchar’s broad popularity and reputation for “Minnesota nice” has been complicated by her reputation as a difficult boss. A BuzzFeed News story Friday reported that Klobuchar had run an office ruled by fear and anger, citing interviews. In emails viewed by BuzzFeed News, Klobuchar berated staffers over minor mistakes, misunderstandings, and misplaced commas. 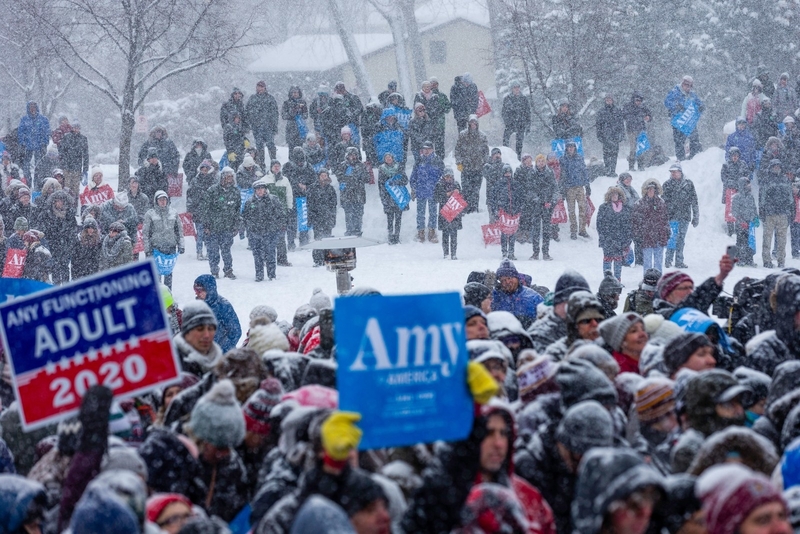 HuffPost reported that at least three people had withdrawn their names for running Klobuchar’s presidential campaign. In the Senate, she has distanced herself from some positions embraced by prominent progressive Democrats, declining to endorse a single-payer Medicare for All bill that some have called a litmus test for progressive Democrats, and defending Immigrations and Customs Enforcement, or ICE, from calls to entirely abolish the agency. She has focused instead on issues like regulating the tech industry and lowering prescription drug costs. Voters cited Klobuchar’s performance in the confirmation hearings for Justice Brett Kavanaugh, where her even-handed questioning of Kavanaugh raised her national profile considerably. After she’d spoken of her experiences with an alcoholic father, Klobuchar asked Kavanaugh if he had ever blacked out from drinking. Kavanaugh challenged, “I don’t know, have you?” He later apologized to Klobuchar.